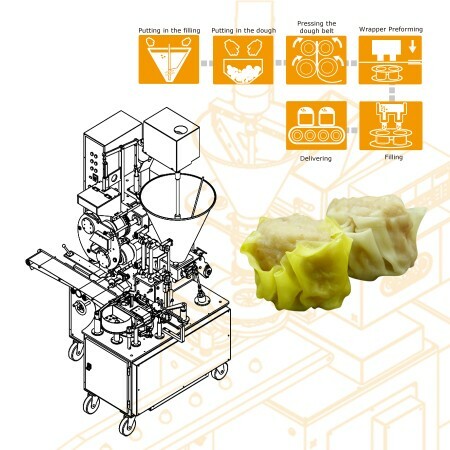 Siomai Machine and Equipment - ANKO High Efficiency Siomai Production Equipment Design | ANKO FOOD MACHINE CO., LTD. Whenever dining in a Dim Sum restaurant, the excitement gradually starts to build up as the dim sum cart rolls out in between the tables, and just when the incredible savory and aromatic fog bursts out from the little steam baskets, Siomai is often what we crave for. Siomai, a type of meat-stuffed dim sum, had not only gained its popularity throughout the world, but also had been recognized as one of Hong Kong's favorite dim sum in the many of the gourmet guidebooks. The origin of “Siomai” is still yet hard to trace, however, there's no doubt that the Cantonese teahouses were credible for making this dim sum item popular and famous. There are many types of different Siomai available on the market, made with either savory meats or even sweet fillings; as it could be easily prepped and served as street food, or sophisticatedly crafted into more refined restaurant delicacy, Siomai has the potential to reflects the taste of a certain season, region and/or a terroir. Nowadays, Siomai is no longer limited as a handcrafted food item, but could also be efficiently mass-produced. The machines listed below are designed for making Siomai. Please feel free to contact us via the form below. We will happy to answer any questions you may have regarding our products, services, and turnkey projects. There is no need to roll out dough by another machine. To put well-mixed dough and stuffing in hoppers is the only preparation for producing 5,000-6,000 pcs/h by Automatic Double Line Shu-Mai Machine. 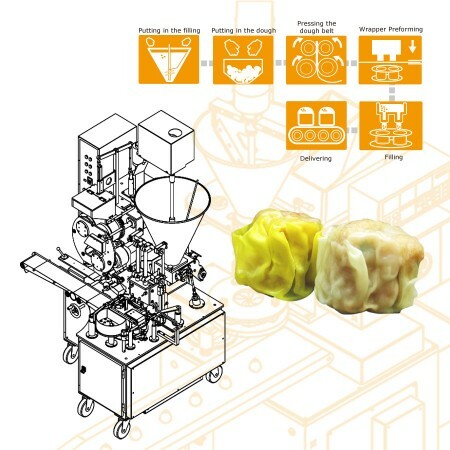 ANKO can customize the mold to adjust the look of shumai and the relative height between wrapper and stuffing. Also, the granule feeding device is a great option to garnish shumai with green beans or chopped carrots for diversifying visual effects.